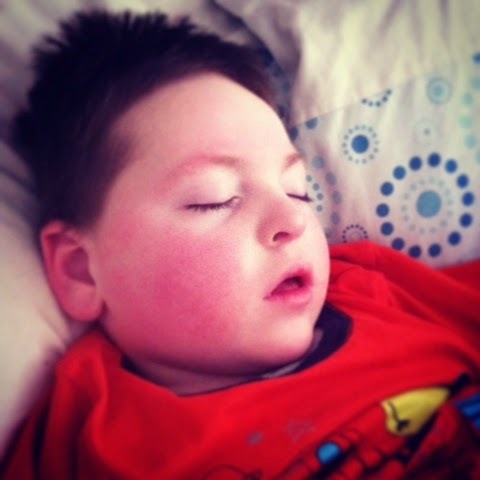 The aftermath of Hugh's seizures often leaves me reeling for weeks. The fear that it will happen again all consuming. The initial adrenaline rush of fighting to keep him alive subsides and I'm left feeling scared and anxious. Having left the comparative safety of the hospital; the careful monitoring of the high dependency unit and the expertise of the nursing staff, once again I am solely responsible for keeping him safe; for keeping him alive! I find it hard to leave the house, overwhelmed with fear that he'll stop breathing when we are out. I check and double check his oxygen and his medications. I move his car seat to the front of the car so I can watch him while I drive. I watch him while he sleeps. Sometimes I have to remind myself to breathe. Yesterday I nearly burst into tears in Tesco, I was so consumed with fear. I know I'll start to relax again soon, I know I won't be checking his breathing every few minutes. But for now, I am scared. Scared of it happening again, as it has so many many times before. This time he wasn't unwell. There was no underlying illness, no recognisable 'trigger' which set his seizures off. I left him at acorns on Monday evening happy and healthy. He left two days later in an ambulance. There was no warning, no signs it was coming. Nothing! That's the hardest thing. Not being able to predict it. Anyone who's ever visited Hugh in hospital has always been surprised at how 'well' he looks. Quite literally, he can be completely fine one minute and then fighting for his life seconds later. At 1.30am on Thursday morning Hugh was rolling around his hospital bed laughing. He was pulling his socks off and grabbing at the wires that were monitoring his heart rate and oxygen levels. The nurses cooed over him and exclaimed at how cute he was. At 2.15am those same nurses were forcing air into his lungs while he failed to breathe; they watched his oxygen levels plummet to 16%, his fingernails turn black. You see, the big "he's home" announcement, made via text and Facebook is only half the story. Yes, he's well enough to come home. Yes, for now, the seizures have stopped. But he's not 'better'. He will never be better. It's just a matter of time before it happens again. A matter of time before he's fighting for his life. Again. Thanks Wry Mummy. We're crossing out fingers and toes. Hugh is of course oblivious and chilled out and happy!